Richard Muller is a Berkeley Physics prof and would-be media star. Dr Muller got some attention a few years ago for some viral lectures slandering climate science and scientists,and whored himself on the Glenn Beck/Fox News circuit. Then he wangled a bunch of money from the Koch brothers to study the temp record. Then he found out that global temps were in fact, rising. Richard Muller is now a media star as the “former climate skeptic scientist who now believes in climate change”. So, following the recent rash of tornado activity, Muller writes in the NYTimes claiming that, paradoxically, there will be fewer tornadoes in a warming world, and was promptly blown out of the water by actual meteorologists and scientists who really know something about the problem. We can safely predict that even more “serious” journalists will now continue to seek him out, flatter him, and help him sell books. Failing up. It’s a strategy. It works. So one is essentially left with the physical reasoning I outlined above. You would think that a physicist would know how to do some physical reasoning. And sadly, in Muller’s case, you would apparently be wrong. To allow Muller to so thoroughly mislead their readers, not once, but twice in the space of as many months, is deeply irresponsible of theTimes. So why might it be that the New York Times is so enamored with Muller, a retired physicist with no training in atmospheric or climate science, when it comes to the matter of climate change? Now, a group of actual tornado and convective storm experts have weighed in. Muller not coming off so well. Research data show that climate change caused by human behavior is fueling more frequent and intense weather, such as extreme precipitation and heat waves — so it’s only natural to wonder if this applies to tornadoes, too. Scientists need more data and time to fully address that connection. Although it is a bit of an exaggeration to say, “backyard dust devils are reported,” Muller notes — correctly— that climate change is not responsible for the dramatic rise in annual tornadoes since 1950. Rather, the larger numbers come from improved detection and reporting of weak tornadoes, particularly EF0 tornadoes, where “EF” refers to the enhanced-Fujita scale used by the National Weather Service (NWS). 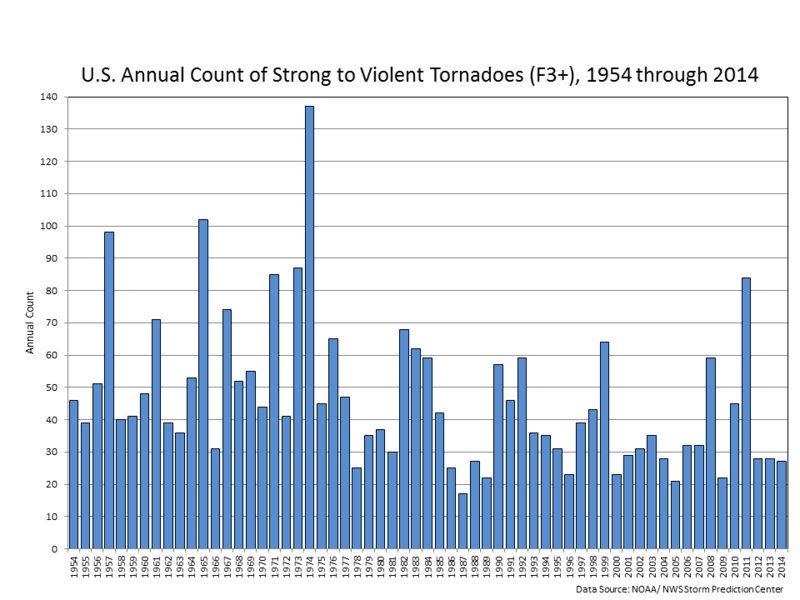 Ironically, the reason Muller says one shouldn’t attribute the increase in weak (and therefore total) tornado reports to climate change is likely the same reason the intensity of tornadoes has appeared to decline:reporting has not been consistent over the period the tornado records span. Tornadoes occurring prior to the mid-1970s — when the NWS adopted the enhanced Fujita scale — received ratings retrospectively by meteorology students who relied on qualitative damage descriptions in newspaper archives. This effectively “inflated the grades” of those tornadoes because the later ratings came only after considerable in-person scrutiny of the damage, often by engineers who considered not just the damage but also the quality of the construction of damaged structures. The evidence for the overrating of earlier tornadoes includes the fact that environments and damage paths of many strong tornadoes in that retrospective era shared characteristics with weaker tornadoes from later years. Also, in another complication in assessing long-term tornado intensity trends, the “damage indicators” used to rate tornadoes recently have changed with the adoption of the EF scale, making it dubious to compare tornadoes of the past with those of the present. Recently, truck-borne Doppler radar observations of tornadoes identified a number of cases in which the radar-measured winds are considerably faster than the official NWS rating implies. For example, the winds measured by these radars in last May’s 2.6-mile-wide tornado near El Reno, Okla., topped 280 mph, which would have placed it well into the EF5 range (200+ mph). The official NWS rating based on the available damage indicators, however, was EF3 (136–165 mph). Finally, Muller’s simple analysis of tornado reports does not address possible changes in the seasonality and/or regional nature of tornado occurrence. In fact, the latest climate-model experiments agree that further global warming is likely to increase the likelihood of conditions favorable to the severe thunderstorms that produce tornadoes in the spring and autumn. Although these climate models do not resolve tornadoes, they do predict an increase in the ingredients responsible for past tornadoes. Paul Markowski, professor of meteorology at Penn State University, was a leader of the recent Second Verification of the Origins of Rotation in Tornadoes Experiment (VORTEX2) and 2013 recipient of the National Weather Association’s Fujita Award for his research on tornado formation. Harold Brooks is a senior research scientist at NOAA’s National Severe Storms Laboratory, has authored numerous scientific papers on tornado climatology, and was a contributing author on the recent Intergovernmental Panel on Climate Change’s Fifth Assessment Report. Although severe thunderstorms are one of the primary causes of catastrophic loss in the United States, their response to elevated greenhouse forcing has remained a prominent source of uncertainty for climate change impacts assessment. We find that the Coupled Model Intercomparison Project, Phase 5, global climate model ensemble indicates robust increases in the occurrence of severe thunderstorm environments over the eastern United States in response to further global warming. For spring and autumn, these robust increases emerge before mean global warming of 2 °C above the preindustrial baseline. We also find that days with high convective available potential energy (CAPE) and strong low-level wind shear increase in occurrence, suggesting an increasing likeli- hood of atmospheric conditions that contribute to the most severe events, including tornadoes. In contrast, whereas expected decreases in mean wind shear have been used to argue for a negative influ- ence of global warming on severe thunderstorms, we find that decreases in shear are in fact concentrated in days with low CAPE and therefore do not decrease the total occurrence of severe environments. Further, we find that the shift toward high CAPE is most concentrated in days with low convective inhibition, increasing the occurrence of high-CAPE/low-convective inhibition days. The fact that the projected increases in severe environments are robust across a suite of climate models, emerge in response to relatively moderate global warming, and result from robust physical changes suggests that continued increases in greenhouse forcing are likely to in- crease severe thunderstorm occurrence, thereby increasing the risk of thunderstorm-related damage. There has been a lively conversation on severe storm/climate change science in the wake of Typhoon Haiyan and the November tornado outbreak. Certain key ideas seem to be bubbling to the top, and this will probably be the subject of a video soon after I return from AGU. I do hope Muller goes back wherever he came from. He is the only person I think able to get 97% or even more people to agree in any climate debate, to agree that he knows zero about what he is talking about that is. Some scientists nowadays just have a habit of blurring the line between pseudo science, and good science fiction.